1640. A ghastly curse fell upon a beautiful island in the Indian Ocean, making it the perfect location for pirates to hide their loot. Centuries later, pieces of ancient treasure maps were found by you and your fellow treasure hunters. 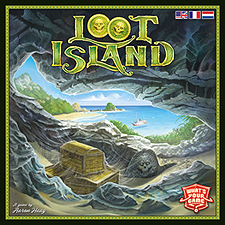 Join them to assemble the maps to find the treasure, but at the same time ruthlessly compete with them to get the biggest share of the loot for youself. It is pirate treasure after all, arrr!